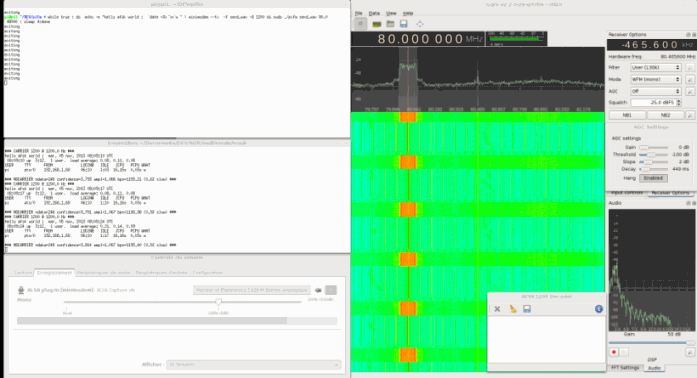 Hackaday brings to attention a simple hack where hacker Marc uses an antenna connected to a general purpose I/O (GPIO) pin on his Raspberry Pi to wirelessly transmit a wav file via AFSK modulation to his RTL-SDR. He uses a program called minimodem to encode the wav on the Raspberry Pi and then on the PC to decode the data received by the RTL-SDR. Using this method, it is claimed that a signal can be transmitted up to 50m away, even through walls.